Beginning with a focus on some of the earliest and most dramatic archaeology of Northern Peru, we wend our way from Lima up the Pacific desert coast, to Caral, a candidate for "first urban center of the Americas", then make a detour across the high Andes and down into the Upper Amazon basin, to visit the mighty and still awe-inspiring complex of Chavín de Huantar. We then return to the coast to visit the glorious cities and temples of the later Moche and Chimú civilizations, and glimpse the vestiges of an opulent Spanish colonial era in the modern city of Trujillo. Our tour ends in Chiclayo, with visits to Sipán, where the most sumptuous tomb of the Americas was discovered in 1987, and the Royal Tombs of Sipán museum, where these artifacts are displayed. We return to Lima by air. We set off early by private vehicle from Lima, heading north up the Pan-American Highway. After about 2 ½ hours, our first major stop is Caral, once an important center of the ancient cultures of the Norte Chico, the remains of whose rock-and-earth stepped-pyramids lie scattered across this desert region. Caral is the perfect place to begin a tour of early Peruvian civilizations, since archaeological evidence suggests that this extremely old religious and residential complex was the cradle of Andean civilization, perhaps the oldest urban center of the Americas, establishing patterns of monumental construction and religious worship that persisted for millennia. Here around 2,600 BC, while the ancient Egyptians were beginning to construct their pyramids, early Peruvians established a less hierarchical society, one based on marine resources, that apparently thrived peacefully on trade and a now forgotten religion. We continue a short way north and then turn inland, climbing into the Andes up a sinuous and dramatic paved highway that takes us across a high pass and into the famous Callejón de Huaylas, the valley of the Santa river, and home to Peru´s highest snow-capped peaks. This morning we explore the intriguing remains of a mysterious, powerful and astonishing civilization. Chavín is known to archaeologists as the wellspring of the "Early Horizon" period, dating from around 800 BC. These were the first Andean people to spread their cultural and religious influence far and wide, all the way to the coast, and as distant as about 300Km/200 miles south of where Lima stands today. Their center here at Chavín de Huantar straddled trans-Andean trade routes, and drew pilgrims to a great temple, where esoteric rituals were practiced under the influence of powerful hallucinogens. Here we see the subterranean labyrinth which once boomed with the sound of water rushing through hidden channels, and where a great stela (the Lanzón) carved with ferocious mythical creatures and mysterious symbols still stands in its central chamber. We take another scenic plunge from Andes to Pacific coast, and reach the site of Sechín Alto, the site of a coastal civilization which pre-dated Chavín, and was probably its cultural ancestor. Here an early Peruvian civilization built a vast enclosure ringed with great monoliths carved with gruesome scenes of battle, mutilation and death. Scholars argue about whether these were literal representations, or symbolic depictions of these people´s ritual lives, but most agree that the people of Sechín Alto were the predecessors of the highland Chavín culture. Sechín Bajo, an early part of this site dating from a previous period -- perhaps as far back as 3,500 BC -- vies with Caral for the title of "first urban settlement of the Americas". After lunch we continue northward up the Pan-American highway to Trujillo. This city, founded in 1534 on the orders of Francisco Pizarro, maintains a colonial atmosphere, with its spacious main square, and marvelous colonial-period adobe buildings in the coastal colonial style, featuring huge barred windows and massive wooden doorways. Tomorrow we will get a close-up look at its fine colonial architecture. DAY 4 TRUJILLO: THE COLONIAL CITY, THE GREAT ADOBE PYRAMIDS OF HUACA DE LA LUNA AND HUACA DEL SOL, THE PICTURESQUE BEACH RESORT OF HUANCHACO, AND THE PRE-INCA CITY OF CHAN CHAN. We begin a full day of touring and exploration around this fascinating area. Touring the historic center of Trujillo, a city whose heart still pulses with colonial splendor, we visit the immense main square and the spacious mansions built by Spanish and Creole gentry during the 17th and 18th centuries. After our city visit we drive a short way from Trujillo, to visit the Huaca de la Luna, and the Huaca del Sol, two huge flat-topped pyramids built by the Moche culture between 0 and 600A.D. The Huaca de la Luna is an extraordinary demonstration of what patient long-term archaeology can achieve. 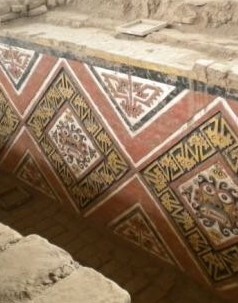 Here, at a site that has been well known and frequently looted for centuries, excavations have revealed layer upon layer of ancient construction, uncovering wall after wall of colorful friezes that were intentionally buried by the Moche, and had not seen the light of day for one-and-a-half thousand years. Bloodthirsty fanged deities and exotic gods in the form of spiders, snakes felines, octopi and other marine creatures rub shoulders with lines of dancers, warriors and naked prisoners, and scenes of ritual combat. One wall is covered with such a multitude of mystifying symbols that it has been labeled simply "The Complicated Theme" -- until some future archaeologist can offer a plausible explanation of them. A site museum to display material unearthed here is under construction, and when opened it will be part of this visit. We continue on to the nearby beach resort of Huanchaco, where we have a chance to try the superb seafood of Trujillo at a restaurant overlooking the Pacific Ocean. Here fishermen still paddle out to sea, kneeling on caballitos de totora -- little one-man reed rafts which have been used for millennia to collect the abundant bounty of the Pacific Ocean. After lunch we return to Trujillo, stopping at the great Chimú center of Chan Chan, the largest adobe city ever built. 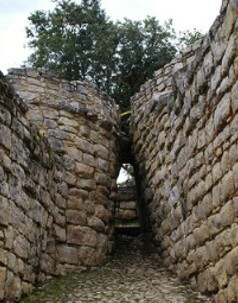 It was in fact an elite settlement, a series of nine enormous palaces belonging to successive rulers of the Chimú realm. At its height the population here may have reached 50,000 people. 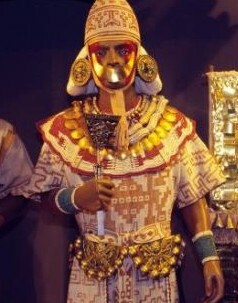 Many of them were artists and craftspeople, who made the sumptuous goldwork, textiles and pottery for which the Chimú were famous. At the Tschudi palace enclosure we enter a labyrinthine series of courtyards lined with clay friezes of fish and ocean birds, and walled in places with an open meshwork adobe building style believed to represent fishing nets. We visit inner patios, residences, administrative buildings, temples, platforms and storehouses, and a huge reservoir where "sunken gardens" may have produced specialized crops for the Chimu nobility. DAY 5 TRUJILLO TO CHICLAYO: THE MOCHE TEMPLE OF EL BRUJO, PERUVIAN PASO HORSES, AND AN ELEGANT NORTH-COAST LUNCH. We set off early, heading north by road up the Pan-American highway and into the adjacent Chicama river valley, then making a short detour to the Pacific shore to visit the archaeological site of El Brujo. This site, featured in National Geographic magazine after the sensational discovery here of the mummy of a tattooed priestess, buried with a variety of ceremonial and military accoutrements. An extraordinary array of multicolored murals dating from seven or more phases of construction depicts both scenes from the daily lives of the Moche, and gory rituals of sacrifice. Continuing northward, we make a stop at a hacienda in Paiján to enjoy a delicious lunch, along with a colorful display of the skilled horsemanship of local Peruvian paso horses and their riders, who combine their art with the dance and music of the northern marinera. This is an optional activity (cost not included), which we highly recommend. DAY 6 CHICLAYO, THEN LIMA: THE “CRACKED PYRAMID”, TÚCUME, AND THE ROYAL TOMBS OF SIPÁN. In the morning we set off for the mud-brick pyramid that made world headlines in 1987 with one of the most sensational finds of recent archaeology. Known as the Huaca Rajada -- the "Cracked Pyramid", because of the deep gulley’s weathered into its flanks -- this eroded adobe platform yielded fabulous ancient treasures from a series of deeply buried tombs of the pre-Inca Moche culture, who lived in the valleys of Peru's north coast 1,500 years ago. To get there we drive east up the broad, flat Reque valley past fields of sugarcane studded with varicolored pastel foothills of the great Andean chain, then arriving at the modern village of Sipán. Here we see the tombs themselves, with superb reconstructions of the burials of priests and chieftains, together with their sacrificed guards and companions. A highly informative site museum tells the story of this extraordinary civilization, who created some of the finest pottery, jewelry and gold working of the Americas -- while also staging macabre costumed rituals of combat, sacrifice and propitiation as they sought to mediate a never ending struggle between the forces of Order and Chaos. Here we see the incredible array of precious symbols and images, stones and shell necklaces, ear-plugs and headdresses that were worn and displayed at Moche ceremonies, and also learn what is known of their meaning. This astonishing visit ends at an "animated waxworks" exhibit of the lords and retinue of the Moche court, allowing us to glimpse and imagine the world of an unfamiliar but dazzling civilization that thrived here at a time when Europe was sliding into the Dark Ages after the fall of the Roman Empire. After these sensational experiences we return to Chiclayo for a delicious lunch of Peru's northern-style cuisine at a top local restaurant. We then drive onward to an oasis of calm at Tucumé, today's final destination. Here we see the chronological sequence that followed the fall of the Moche, at a site where their descendants, the Sicán culture, continued to amass millions of adobe bricks for the building of mighty pyramids -- including the longest of its kind, at more than 700m -- but were now influenced by highland tribes, and began to abandon their old ways. The history of this scenic site -- extensively investigated by the famed Norwegian explorer Thor Heyerdahl -- leads us all the way to the Incas, who conquered the region not long before they, in turn, were conquered by the Spanish. We can climb to a viewing platform with superb views of the surrounding pyramids and the dry woodland habitat of the Leche valley. We can also visit the small, intimate and low-tech site museum, to enjoy the excellent collection of excavated objects, dioramas of daily life, and models of the pyramids. 1-Please note that on Mondays the Museum of Royal Tombs of Sipan and the Museum of Sican are closed. Instead we may offer the Bruning Museum. 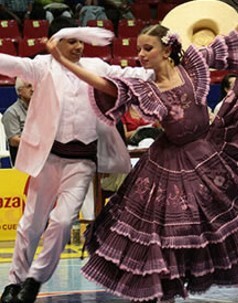 2-The city tour in Trujillo suggested program Monday through Friday between 9 am and 2 pm. Outside these hours that may be widescreen or alternative views. 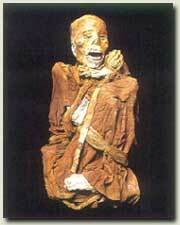 3-Just like to note that on Mondays the Cajamarca city tour is not operational. Only can be offer as panoramic.